While many modes of transportation have made decent use of digital signage, urban bus transit systems are just now coming to the party. Bus lines trace their heritage back to the early days of stage coaches. Often, the stage depot was just a chalk board on the wall in front of the town’s hotel. The board was updated as needed by the stage drivers and if it was in a “civilized” town, telegraph operators were employed. Fast forward to today’s typical city bus station or substation and not much has changed. Routes and times are posted on a variety of custom hardboards, CRT monitors and even the venerable dry-erase board. They really don’t provide any more utility than the original chalk board. But what has changed is the environment that urban transit system must serve: a fast-paced culture and diverse citizenry that expects a level of performance. If a plane is five minutes late most people don’t grumble very much, but when a bus leaves the passengers standing outside for five extra minutes on a cold, windy day, out come the pitchforks! Consider that arrival and departure boards in airports really only need to display one of three messages: delayed, cancelled and on time. This holds true for train signage as well. While bus transit systems have similar requirements, they also have a huge exposure to many possible scenarios that require alternative messaging. Urban transit systems often have to deal with things like traffic accidents that require an adjustment to the schedule. Pre-scheduled or unplanned utility work may close a portion of a street on a particular route. In that case, the sign system will have to adjust the route and schedule information for several days or weeks. Most of this type of message cannot be pre-packaged. The power behind digital signage for a bus line is the flexibility and ease of scheduling content. The most basic deployment can feature multiple well-placed large-format displays running simple schedules and route diagrams. Multiple languages rotating in the same area of the display can also be added. Creating time-of-day content schedules ensures only content that applies to that particular period of time remains on screen. Adding a touch-screen kiosk gives users the ability to receive several levels of information as needed and in display or printed format. 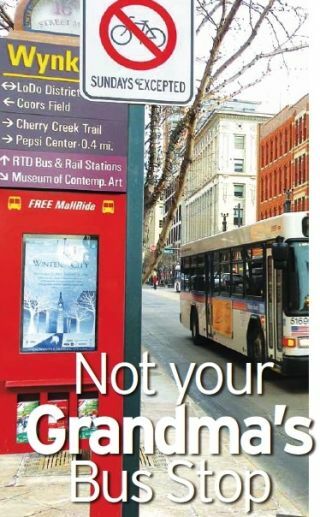 In a recent deployment for a Colorado public transit system, they wanted the option to trigger content changes rapidly for emergencies and other events. They employed a simple Twitter feed as the data source. When staff tweets a certain keyword from any cell phone or computer, the pre-packaged content appears almost immediately on the public displays. A social media trigger gives content control to staff on the local level and at the point of influence. Using pre-defined content packages ensures that the message complies with the organization’s standards. Of course many other benefits ride along with a top-notch digital signage effort. Riders waiting for the bus are able to receive weather, news and other local interest information, which results in a less stressful and more positive experience. The biggest benefit to the transit authority has nothing to do with the rider experience. By inviting local advertising, the transit authority can drive revenue to support and expand the digital signage system. For many transit authorities, this is an easy add-in as they already have the mechanism in place to sell and service advertisers. Bus wraps and placards have long been a source of revenue for their operations. Now using the digital signage system to display paid ads can give the advertisers an extra boost and justify a larger portion of their ad budgets. The additional revenue generated can be used to offset budget cuts and any increased expenses. The use of QSR code and Smart Tags helps drive customers to their expanded messages on websites. With specific tags and codes, the advertisers are able to track exactly what influence the transit advertising has on their business. But wait, there’s more! Like all good digital signage deployments, there is a public and a back-of-the-house approach. After successfully displaying timely information for their customers, the organization can use the same digital signage system to communicate with the entire staff. Displays in break rooms and office areas can post safety bulletins and urgent announcements as well as team-building and personnel information. A digital signage system can function as a Swiss army knife of visual communications. Emergency messaging, employee communications and public information kiosks all combine to create an internal communications network that helps transit authorities stay up to date and on time.